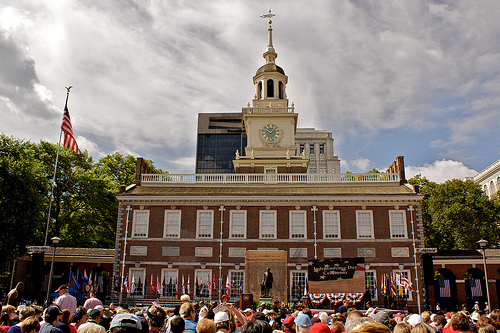 Yesterday, on the 234th anniversary of America’s liberation from the British Empire, my six-year-old son and I braved a merciless Philadelphia heatwave to watch the proceedings at Independence Hall. We Philadelphians like to think of July 4 as “our” day. After all, it was here that the reckless and revolutionary American Experiment launched itself on that fateful day in 1776. Though dwarfed by some of its latter-day neighbors, stately old Independence Hall looms large in the Philadelphia cityscape and our national imagination. Its handsome spire-topped belfry still soars stirringly into the heavens — though I regret to inform you that this particular belfry is only a faithful replica of the original, which rotted away more than two centuries ago. The massive brick structure beneath the belfry is original, though. For a few history-shaking weeks, it housed the likes of Ben Franklin, Thomas Jefferson, John Adams, John Hancock & Co. — just possibly the finest flock of white males ever assembled in one place, at least until the Constitutional Convention eleven years later. It still gives me chills to commune with the ghosts of those gallant men. Mayor Nutter is a bald, genial, amiably wonkish African American man with a trim beard and a penchant for serious budget-cutting. (Given the city’s current financial straits, the mayor has no choice.) Nutter has also raised the hackles of Tea Party types with his outspoken indulgence of immigrants regardless of their legal status. Under his watch, Philadelphia has earned a dubious reputation (at least among conservatives) as a “sanctuary city” for illegals. True to form on this 4th of July, Mayor Nutter extolled our nation’s immigrant heritage and extended a welcoming hand to all newcomers, legal or otherwise. He echoed the prevailing progressive pieties by urging us to let “undocumented workers” earn their legal status and eventually graduate to full citizenship. That much was predictable enough. Then, waving toward the President’s House Memorial under construction just a block away from Independence Hall, the mayor made a pointed reference to George Washington’s “human property” — the nine slaves who lived and toiled on that site more than two centuries ago. Oh no, I thought. Not again. Right-thinking Philadelphians still haven’t recovered from the shock of discovering that a Virginia planter owned slaves… right under their noses. No matter that good Quaker Philadelphia had been a lucrative center of the slave trade for the better part of a century… no matter that Washington took the almost unprecedented step of freeing his slaves in his will and providing for their care and education. For the rest of recorded time, I suspect, the honorable white-headed Father of Our Country will bear the stigma of slavedriver and racist… just as Christopher Columbus underwent a posthumous rebranding as the diabolical scourge of pristine Native American life and culture. 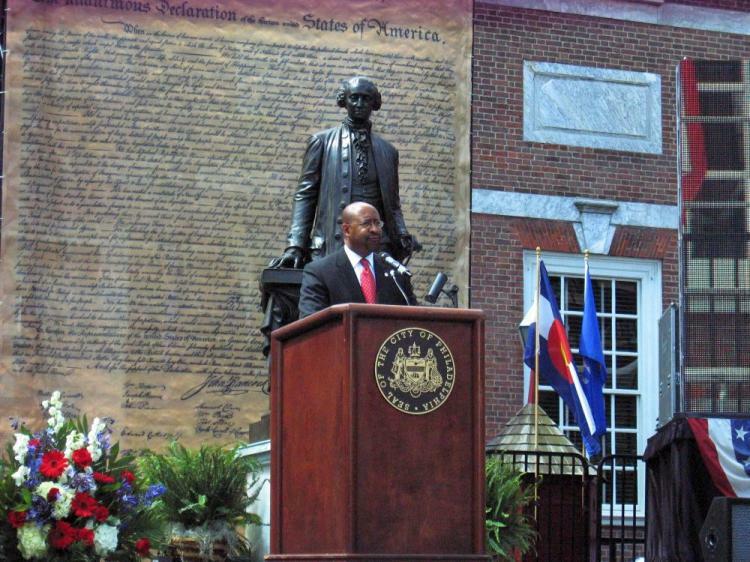 At that moment in the shadow of Independence Hall, on the Fourth of July, 2010, I felt that the old order had officially given way to the new… that I was literally standing on the Great Divide of American history. From now on, the waters would be flowing toward post-white, post-Anglo America. I wondered about the nature of the two Americas I’ve inhabited in my lifetime: the traditional white Protestant America of George Washington, Davy Crockett, Norman Rockwell, Jimmy Stewart and Leave It to Beaver, now in full-scale retreat… and the funky, multi-hued, omnitolerant (there’s a new word for you) America represented by the progressive-minded Mayor Nutter — along with Lady Gaga, Perez Hilton, Twitter, dreadlocks, Oprah Winfrey, home-grown terrorists, reality shows, universal hip-hop, profusely tattooed limbs and all those resolutely Spanish-speaking immigrants, legal and otherwise. The old America was upright but too often restrictive; the new America is open but too often sloppy and degenerate. When Lady Gaga garners more Facebook fans than any other living person (over 10 million and counting), you know we’re riding the Decadence Express. Why are we so enthralled, as a nation, by a woman imitating a man imitating a woman? Why do we still feel compelled to atone for our past and besmirch its heroes? Can we really be comfortable with a future of open borders, bilingual signs and a permanent class of uneducated, unassimilating emigres who essentially function as serfs? Will those newcomers make America more American in the immigrant tradition of yore… or is it time for a wised-up Lady Liberty to stop lifting her lamp beside the golden door? Historians have drawn so many parallels between our world-dominating republic and the Roman Empire that we’ve grown almost immune to the warning lights flashing overhead. Rome was undone by many things, including toxic lead drinking vessels, a low birthrate among the elites and the long slide into decadence after the Age of Augustus. 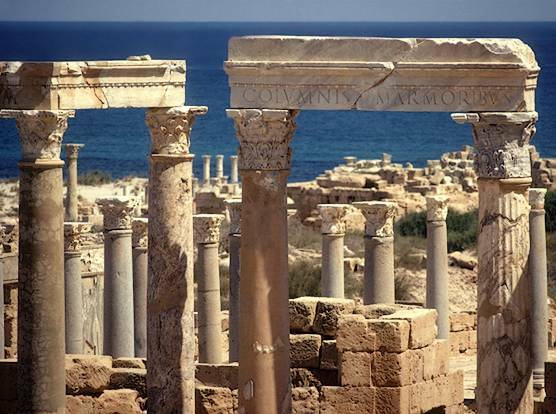 Ruins of a divided empire: could it happen to us? But the single most disastrous trend was the eventual refusal of new immigrants (and Rome was the ultimate multicultural society) to adopt classical Roman traditions and loyalties. Simply stated, too many Romans no longer thought of themselves as Roman. The center fell apart, and the empire finally crumbled under assault from the more vigorous and motivated barbarians to the North. Yesterday, on the Fourth of July here in Philadelphia, I wondered how we Americans could reconcile what was best about our past with what’s inevitable about our future. It’s a daunting task — a delicate balancing act — but not an impossible one. We need to regain respect for the nobler virtues while welcoming diverse (truly diverse, not merely “enlightened progressive”) people and points of view. Above all, we need to reject the splintered and splintering special-interest mindset that seems to have overtaken our politics. Tea Partiers, Left Coast liberals and activists of all stripes must be able to fight their gut instincts and break bread together. If we can’t identify collectively as Americans, then the great experiment that began here back in 1776 will probably fail. “A house divided against itself cannot stand,” Lincoln warned his countrymen as we rolled toward Civil War. Take heed, America. Take heed. Apparently, Rick, you have written something so profoundly truthful that we can’t find anything to discuss or argue over! A really fine essay – thanks. Thanks, Priscilla… I thought it was one of my better ones, too. I guess it didn’t start a firestorm of commentary because it was either too personal or, as you implied, one of those “self-evident” truths like life, liberty, the pursuit of happiness, and our slow-but-sure decline into a “bread and circuses” culture. Lady Gaga’s name recognition is probably greater than that of Charlemagne or even Jimmy Carter at this point. But as with all celebrities du jour, will we be able to say the same in 40 years? Something tells me she won’t be one of the immortals. Two years later and this essay is even more relevant than the day it was written. Well done sir.